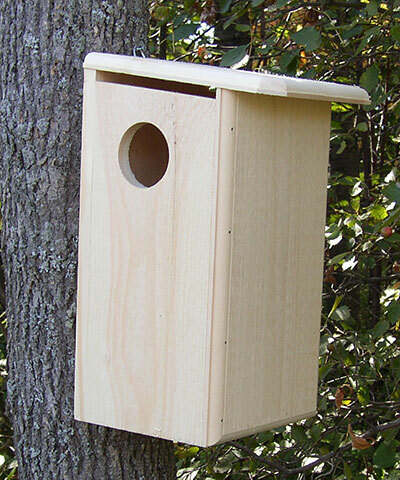 If you enjoy squirrel antics, give them a place to live with the Squirrel House. This home is designed to give squirrels a nesting spot throughout the seasons, especially while the young are still nursing. The house is handcrafted of 0.75" thick white pine to provide insulation from both the summer heat and the winter cold and features ventilation holes at both the top and bottom of the structure. The bottom openings double as drainage holes to keep the nest dry. One large circular entrance is placed on the side, and should be near to the tree trunk when the home is mounted onto a tree using the attached metal mounting hook. The opposite side panel latches and lifts upward for seasonal cleaning, and the rough hewn interior is perfect for teaching little squirrels to climb. The Squirrel House will provide amusement for you and your squirrels for years to come. Made in the USA.